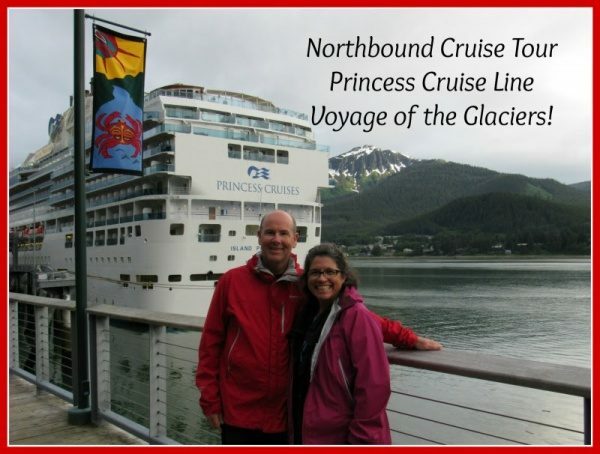 A Land & Sea Alaskan vacation has long been on our bucket list and in June of 2018, we sailed our first Princess Cruise Tour itinerary which included a 7 Night Inside Passage cruise and then 4 nights in Alaska. Our sailing was a Northbound sailing that began in Vancouver, B.C. to Whittier, Alaska (Anchorage). The itinerary included stops at Ketchikan, Juneau and Skagway as well as sailing days in Glacier Bay and College Fjord. Upon disembarking in Whittier, we boarded Princess Railways for the 10 hour transfer to the Princess Denali Resort. We spent two nights there before moving on by motor coach to the Princess Mt. McKinley Resort about 2 and a half hours away. After a one night stay there, we again boarded a motor coach for another two and a half hour transfer to Anchorage. We spent our final night in Alaska at the Captain Cook Hotel before flying home the next day. Our cruise was aboard the Island Princess which was built in 2003 and is one of the smaller ships in the Princess fleet. She does show her age a bit in the decor and some wear & tear but was very clean and well maintained. We have sailed the Inside Passage of Alaska prior to this sailing and always enjoyed a stateroom with a balcony/verandah. For this reason, we opted to stay in a mini suite as this choice offers a large balcony with plenty of room to sit back, stretch out and enjoy the amazing Alaska scenery! 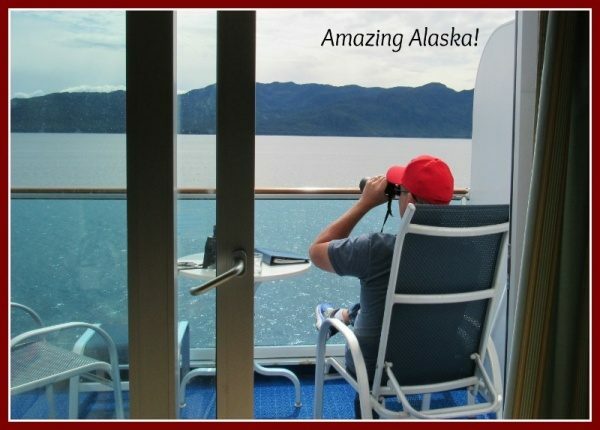 The view of amazing Alaska from our stateroom balcony! For this cruise, we tried the anytime dining option for our evening dining time and found it to be a great fit for this itinerary! We like the flexibility of spending as much time as possible ashore on our port days and with anytime dining, we did not feel pressed to get back to the ship for our evening meal! The food in our main dining room The Bordeaux, was very good and as was the service. The buffet restaurant on deck 14 forward is the perfect viewing area on the ship for this itinerary as the entire restaurant has floor to ceiling windows and gives you a 180 degree view of where you’re headed. We also dined at The Bayou Cafe, one of the specialty dining venues onboard and enjoyed the atmosphere, great food and wonderful service. We booked two lounge chairs in the Sanctuary for the day of the Glacier Bay sailing. 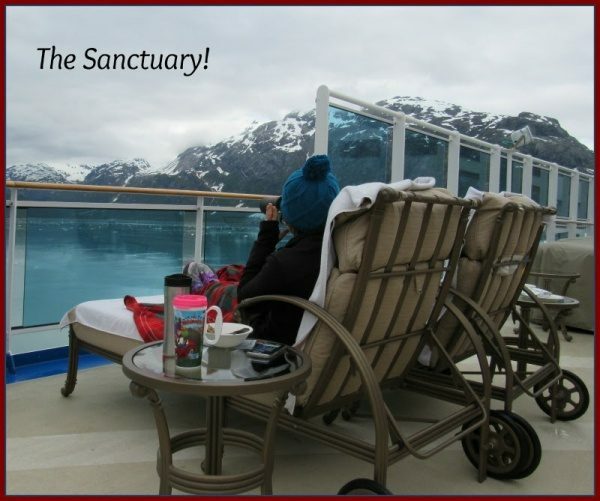 The Sanctuary is a private area at the aft (back) of deck 14 where you can reserve a cabana or lounge chair from 8AM to 5PM to avoid cueing up at the rail to see the glaciers. This turned out to be worth the $60 per person fee as we had a mostly unimpeded view for most of the day. Our day included hot coffee, water, hot cocoa, snacks and a hot lunch. Enjoying an unobstructed panoramic view! Other impressions from our week on the ship and our first sailing with Princess would include praise for the way they handle your luggage from the time you arrive at the airport, to the transfers to the train and hotels. The process was seamless and efficient. We also applaud Princess for their use of naturalists, Park Rangers and guides to further enhance the guest experience. The staff was friendly and the ship was well run, and our room steward was amazing. He went out of his way to ensure our room was to our liking and the our sailing experience was smooth. Riding the rails with Princess Railways to Denali Princess Loge. We boarded the Princess Railways upon arrival in Whittier and the train ride was very long though comfortable. The views were absolutely stunning and the onboard staff were very attentive. We spent quite a bit of our time in the dining car since it was not being utilized much by our fellow travelers. We really enjoyed the service team in the dining car and their friendliness. The rail cars consisted of a dining area and bathrooms on the first level and a glass domed passenger seating on the second. You could purchase food and beverage from your seat or go down to the small dining area. There were some special treats along the way such as champagne, warm cookies, a visit from a dog musher, two Denali Park Rangers and a running commentary on what you were seeing. Once we arrived at the station inside the Denali National Park, we were transferred by motor coach to the Lodge. From the Denali Princess Lodge, there is a complimentary shuttle to take you to/from the National Park Visitor Center and from Mt. McKinley Lodge, there was complimentary bus for guests to take the one hour ride into the nearest town of Talkeetna. In both locations we did take advantage of the complimentary transportation and we also booked excursions through Princess as well. The National Park Visitor Center is an interesting stop and you can also take a connecting short shuttle to the Dog Sled Demo where you are able to see a demonstration of the Park’s sled dog team and learn more about the history of mushing. There was no extra cost associated with this and it was fun to see the dogs up close and see their power and passion. We took the bus back to the Visitor Center, picked up a trail map and headed out for a self guided hike of a nearby lake. It was there that we had our first animal encounter with an iconic Alaskan mammal. We came upon a female Moose feeding peacefully in the lake. She was unconcerned with our presence and in a matter of a few minutes was joined by another female with a very young calf. We spent the next half hour just watching these three Moose graze and play in the water. It was the highlight of our trip to witness this and it made the 2 and half miles of hiking worthwhile. We returned to the Lodge to eat and get ready for the excursion we booked. Wonderful fun on our excursions and exploring on our own. 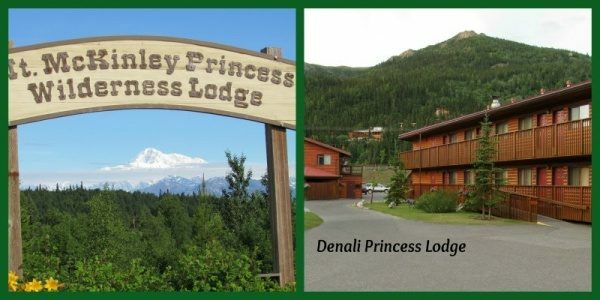 The first excursion we booked through Princess was from the Denali Princess Lodge and it was Jeep Safari. 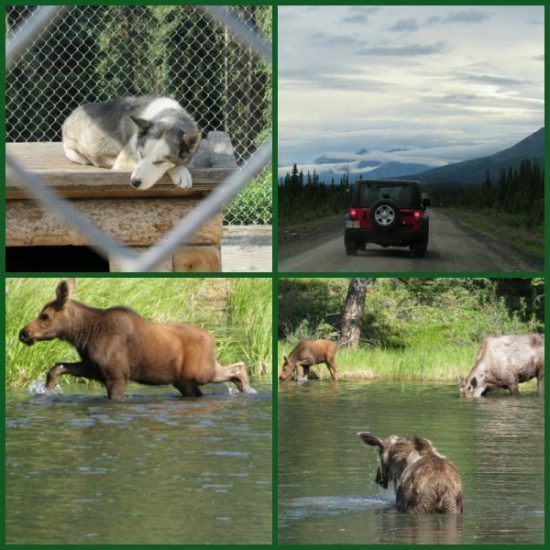 We drove your own Jeep approximately 100 miles round trip deep into Denali to see rugged vistas and animals. Each Jeep was equipped with a CB radio with a speaker mounted on the dash so the guide in the lead Jeep can provide a great deal of information on the history, the scenery and the animals. The second excursion we booked through Princess from the Mt. McKinley Lodge. It was a guided river float on the Talkeetna River. We took a motor coach for the one hour drive to Talkeetna and then walked less than a quarter mile to Talkeetna River Guides to get our gear and hit the river. Our raft had six people plus our guide was an excellent source of information on all things Alaskan. We saw eagles, beaver and part of Denali through the clouds on our approximate two hours on the water. The rafting was fun but so too was our time in Talkeetna before and after the experience. We enjoyed the eating local favorites, like Fireweed Ice Cream and browsing the wares of the local artisans and craftsman. Some impressions from our four days in Denali would include being blown away by the animals and the stunning scenery. The Lodges were nice if a bit basic and at first were taken aback by the lack of Air Conditioning. We were assured by the staff, we wouldn’t need it and they were correct! We opened our window to our room and enjoyed the cool breeze! Our only complaint would be to have had had more time to explore! The guest service was efficient, however, after coming off of the cruise where all meals are included – it took a bit to adjust to having to pay for each meal even though we did budget for this expense. Going into this vacation, we were a bit apprehensive about the packing up & moving so often on during the 4 night land portion of our trip; however, the efficiency & expertise of Princess made this concern a non-issue. We thoroughly enjoyed this Cruise Tour Land & Sea vacation and while we might have checked the box on our bucket list, we will look for an opportunity to return! So long for now Alaska! Venturing to new places, embracing new cultures and stepping outside of our daily box is the gift we give ourselves when we travel. Combining our passion for travel and a love of serving others, we will diligently work to provide you with a unique and memorable travel experience. We have extensive personal travel experience and love to share that experience in planning for our clients trips! We've visited 17 different countries, 26 different US states and have cruised more than a dozen times! We've traveled by train, planes, bus and automobiles. Basically...we love to travel! Disney travel holds a special place in our hearts and is our favorite travel experience. Disney knows how to magically transport families to a place where hectic schedules, busy lives and every day routines are replaced with amazing experiences, travel adventures and memories that will withstand the test of time. We are proud to be College of Disney Knowledge Graduates and have traveled with Disney extensively. 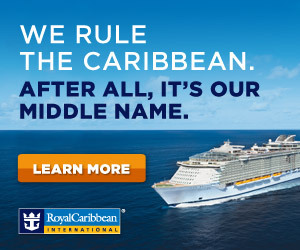 We are also trained specialist with Royal Caribbean Cruise Line, Princess Cruise Line, Norwegian Cruise Line, Carnival Cruise Line and Sandals & Beaches Resorts. Whether looking for an intimate getaway, a group vacation or a multi-generational trip of a lifetime; you can consider us, your personal shoppers as you experience the gift of travel! 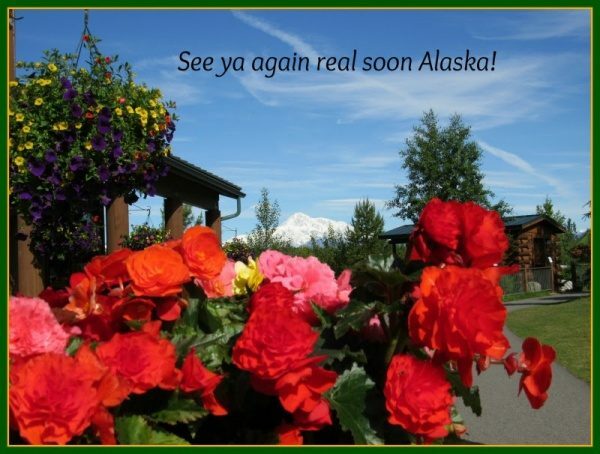 Alaska, Cruisetour, Denali, Mt. McKinley, Northbound, Princess Cruise. Bookmark. The beautiful Danube with Scenic Luxury Cruises!